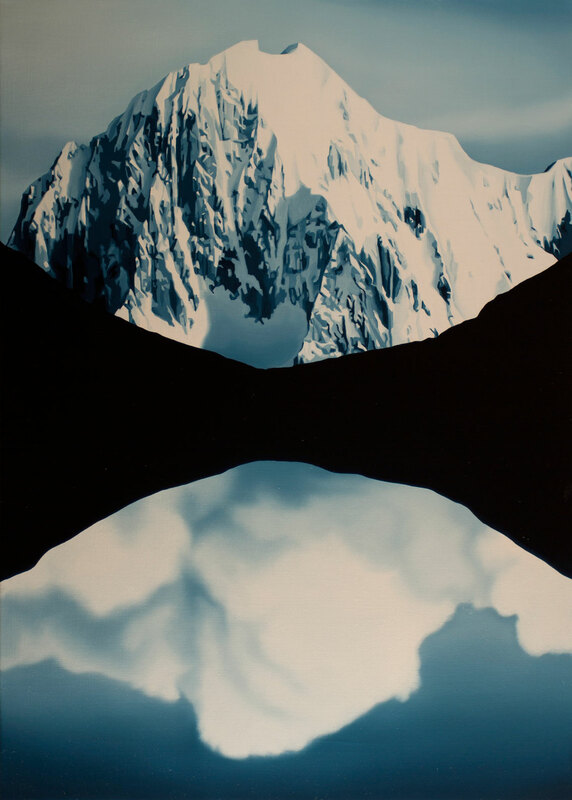 Mountains become portraits of self-reflection and horizon lines become pivot points in Tony Lloyd’s captivating images in paint. A bifurcation of gravity sets free dual realities and you’re left to ponder if they overlap or exist in isolation. This is the tension on which the work sits and what gives it its gravitas. Is a mountain a cloud in a contemplative act? Can a lake supplant the sky and swallow the moon? In ‘Other Worlds’ these slippery shifts are not only possible, but are happening at every turn. The refined colour palette lends the work an austere character that partners with the glossy depth of the paint. This partnership of relations runs across the work like a double helix of dualities. The landforms are landscapes and yet they’re also portraits of isolated natural forms. Clouds pair with mountains as the ephemeral pairs with the inert. Day mirrors night and headlights echo the moon. There’s also relations between the individual paintings within the series. Particular mountains and cloud formations repeat themselves across the space in the room, reinforcing the contemplative nature of the work and building a puzzle of connections. Hovering on the edge of natural realism and a filtering of tone reminiscent of anime or vector images, the works fail to settle into place and vibrate with energy. While the expansive beauty of the natural environment dominates, there are hints of human intrusion. Cabins and rowboats, road markings and vapour trails, all give hints at man’s incursions into the wild. Slightly unnervingly the evidence of this existence is tweaked to loosen a stable grip. The cabins are ghostly homes, the rowboats empty and without shadow, the car headlights criss-cross and drift up above the roads. Theses images represent zones rather places. Liminal spaces activated in reflection and repetition, where shadows swallow up the spaces protected from the light. But the glowing reach of the light tries desperately to finds its way through, permeating the atmosphere of these zones – refracting a circular halo in the humidity of the air, pressing its potency into the brightness of snow, and ingratiating its way into man-made fabrications of glass. With its chilly grip on the temperature gauge, this suite of paintings charges the atmosphere of the gallery and coaxes vapoured breath from the viewer. Crisp and clean, evocative and thoughtful. Tags: Dianne Tanzer Gallery, Tony Lloyd. Bookmark the permalink.